A good VPN with acceptable speeds in most locations. Romania-based ibVPN (Invisible Browsing VPN) does not have a beautiful app. It looks a little dated, in fact. Despite that, however, I found it surprisingly easy to use and very helpful. I’d never heard of ibVPN until its publicity people contacted me requesting a review and asking how much it would cost. Sadly, it’s becoming quite common for press representatives to expect to pay for coverage. No money changed hands for this review, however. As with every other VPN reviewed on this site, I received a test account to try the service and then wrote this review. 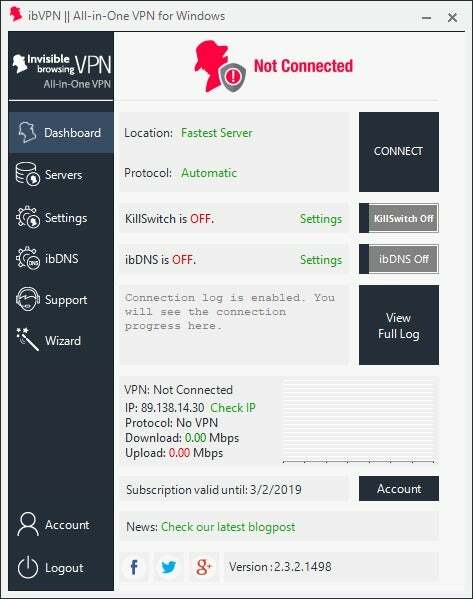 When you first jump into ibVPN for Windows, you get a single-panel interface with the default dashboard as your starting point. From here you can see whether you’re connected to a VPN, the protocol you’re using, whether a few of the extra services are on or off, a bandwidth graph, and the current status of your account. There are two ways to navigate the app. You can either click on the various categories in the left rail; or for certain items, just select the links within the dashboard itself. Clicking on the link for the Location heading at the top of the dashboard, for example, opens the app’s second panel to reveal all the server choices. You could accomplish the same thing by clicking Servers on the left rail. That’s what I mean when I say the app is helpful. It offers two methods of accomplishing the same thing, which can sometimes make an app cumbersome. In this case, however, it’s catering to two different ways of understanding how the app should work, and that’s a good thing. The bulk of ibVPN’s features for most users is under the Servers panel. Here you can select your country location, and each server has a small percentage indicator to its left showing the available space on that particular server. At the top there are also generic category server selection options such as Fastest Server, or Fastest P2P Server. At the top of the expanded servers panel there are two additional tabs: Protocols and Wizard. Protocols is a great tab for power users who want more control over VPN protocol choice. You’ve got options for L2TP, PPTP, SSTP, IPSec (IKEv2), OpenVPN (UDP or TCP), and Stealth VPN. The latter is designed to make your VPN traffic look more like normal HTTPS traffic in order to draw less attention from snoops that might be trying to block a VPN connection. ibVPN’s Wizard tab lets you choose the right type of server for the job. The Wizard section should be just about enough for anyone, but if you want more, the Settings feature has various basic user preferences you can tweak. These don’t include much that’s overly technical—it’s mostly settings for auto-connect, auto-login, starting the application at launch, and so on. One last notable feature is ibDNS. 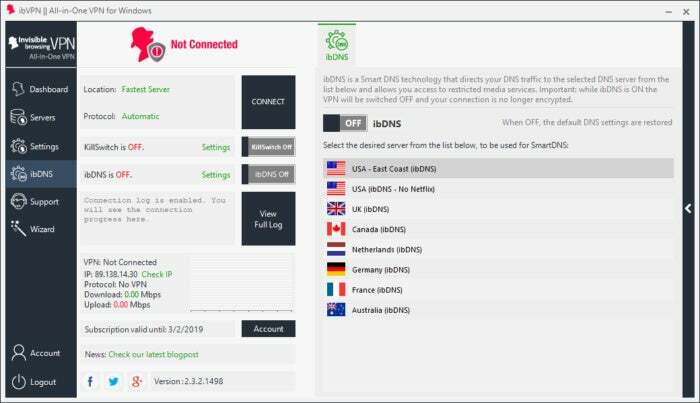 This is Smart DNS technology for accessing restricted media sites like U.S. Netflix without turning on an encrypted VPN connection. This can have some advantages such as not losing your base internet speed connection. It’s also available as a standalone service for those who are more interested in getting around regional restrictions than keeping their internet traffic private. Overall, speeds were okay, coming out at 26 percent of the base speed based on an average of five different locations. As usual, however, that doesn’t tell the whole story. The U.S. speed was particularly standout at nearly 50Mbps—the base speed was 90Mbps on the day of testing. Every other location was above 10Mbps, with a 20+ score in Australia and the UK. IbVPN is owned by Amplusnet SRL, with a business address of Blv. 1 Decembrie 1918, No. 52/1, Târgu Mureș, Romania. This address is not listed on the ibVPN site, but you can find it after a little poking around. Amplusnet’s managing partner is Adi Roman, and Dan Gurghian is the IT Director as well as one of the co-founders. As far as privacy goes, ibVPN makes the usual promises: that it does not collect or log any traffic. For payments you can use credit cards, as well as a host of cryptocurrencies including Bitcoin, Litecoin, Dogecoin, and Ripple. There’s also Paymentwall and a bunch of other international options. You may also notice that there's no direct PayPal option, but it is available via third-party payment provider Gate2Shop. The ibVPN approach is to have users pay first, and then sign up for their account with a code afterwards. However, anyone who wants to try the service can get a 24-hour free trial. To sign up ibVPN asks for a name and email address. There are a variety of service levels for ibVPN. 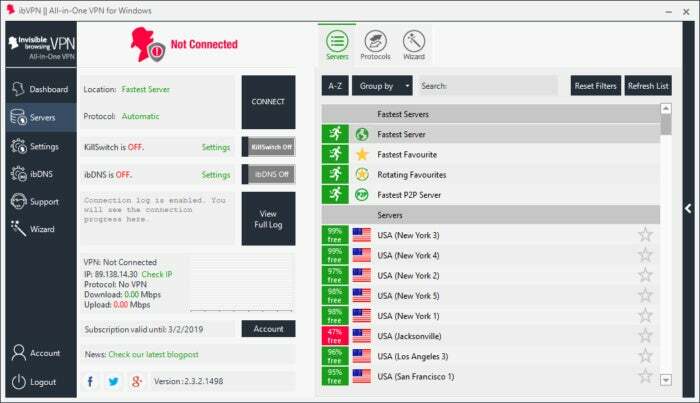 The top level is Ultimate, which gives you access to the VPN with more than 180 servers in 57 countries, the ability to download torrents over the VPN, and five simultaneous connections. The ultimate plan also covers the SmartDNS and proxy services for $58.06 per year. The standard VPN tier offers more than 140 servers in 44 countries, and only one simultaneous connection for $37 per year—no torrents allowed. There’s also the torrent VPN tier with one connection and 21 servers in nine countries for $37. Finally, also for $37 per year, you can get the SmartDNS service for watching media-restricted contented without using a VPN. For basic users, ibVPN is a good choice with lots of easy-to-understand options. More experienced users can also get a lot out of ibVPN, including a granular selection of servers and specific protocols to use. The speeds are average, but they are still more than acceptable for most users. Romania-based ibVPN has some serviceable speeds, a good number of choices for servers, and a usable but not outstanding Windows app. There's also a SmartDNS service for getting around regional restrictions without using a VPN connection. It's not an incredible service, but it will do what you need at a reasonable price.